NEW YORK (April 10, 2016) – Navy quarterback Keenan Reynolds and UConn forward Breanna Stewart are the 86th AAU James E. Sullivan Award winners, the Amateur Athletic Union (AAU) announced today during a ceremony at the New York Athletic Club. It was just the second time in the award’s illustrious history that multiple recipients were recognized as the top amateur athletes in America. The finest Navy quarterback since Roger Staubach, Reynolds led Navy to a school-record 11 wins against two losses in 2015-16 and the school’s best end-of-season ranking (No. 18) in more than 50 years. He finished fifth in the Heisman Trophy voting and was named a third-team All-American. Reynolds is the all-time leader in FBS history in touchdowns scored (88) and rushing yards by a quarterback (4,559). Reynolds led the Midshipmen senior class to 36 career wins, tying the Navy class of 1909. Well-respected by his peers, Reynolds was made a unanimous captain for the 2016 East-West Shrine Game and went on to win the Pat Tillman Award, which is presented to a player who best exemplifies character, intelligence, sportsmanship and service. Reynolds is the third straight college football player to claim the award. Ohio State running back Ezekiel Elliott, who was on site to present the award this year, claimed the award last year after leading the Buckeyes to the first-ever College Football Playoff National Championship in 2015. Penn State offensive lineman John Urschel took home the 84th AAU Sullivan Award the year prior. The best in women’s basketball and likely No. 1 overall selection in the 2016 WNBA Draft next week, Stewart just wrapped up her fourth straight NCAA National Championship with the Huskies. She earned her fourth NCAA Final Four Most Outstanding Player of the Year honors and finished her career with more than 2,500 total points and more than 1,000 career rebounds. 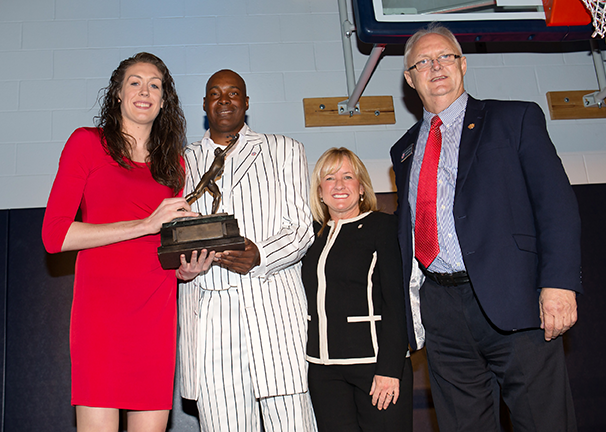 Stewart is the first women’s basketball player to win the award since Coco and Kelly Miller took home the award in 1999. Stewart was unable to attend the ceremony due to the Huskies’ National Championship parade in Hartford, Conn. She will receive her award during the 2016 Celebrate the Season event at the Werth Family UConn Basketball Champions Center on Monday at 7:30 p.m.
Visit aausullivan.org for more information.